The cat townhouses at The Cat’s Inn represent a departure from the traditional view of cat boarding and a step forward in creating a more healthy, humane and safe option for housing cats. Developed by veterinarian Dr. Paul Wade, who saw first-hand the problems involved with boarding cats for any duration of stay, these townhouses provide a novel new solution to an age-old problem. 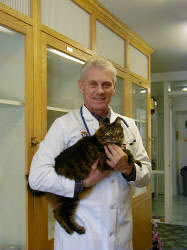 In a busy clinic, multiple cats would often need to be housed for short-term recovery – often in the same enclosure. This led to potential for upper respiratory diseases and other maladies to spread, not to mention conflicts between the animals, cold and inhospitable cages and – often – the noise and frights of boarded dogs at the same facility. With these factors in mind, Wade set about creating the cat townhouse as a more convenient and humane alternative. Featuring a more comfortable construction that’s durable yet highly cleanable, and offering amenities that help cats feel more secure, like a secluded bathroom area and elevated points with clear lines of sight. The townhouses also include Wade’s patented ventilation system, which helps remove not only litter box odors, but also airborne diseases. Whether for use in a veterinary clinic, a boarding facility or for short-term housing, The Cat’s Inn’s townhouses provide a healthier and more attractive option for keeping cats. Easy to assemble – only a simple screwdriver required – and maintain, Wade continues to further refine and improve these townhouses to ensure that cats have a clean, safe and comfortable environment for their stay away from home.